101 jammers, one cruise ship and 1,043 miles of Norwegian coastline – there were some pretty big numbers involved in Splash Jam, but they paled in comparison to the the scenery around us, and the spectrum of games produced during this long weekend. 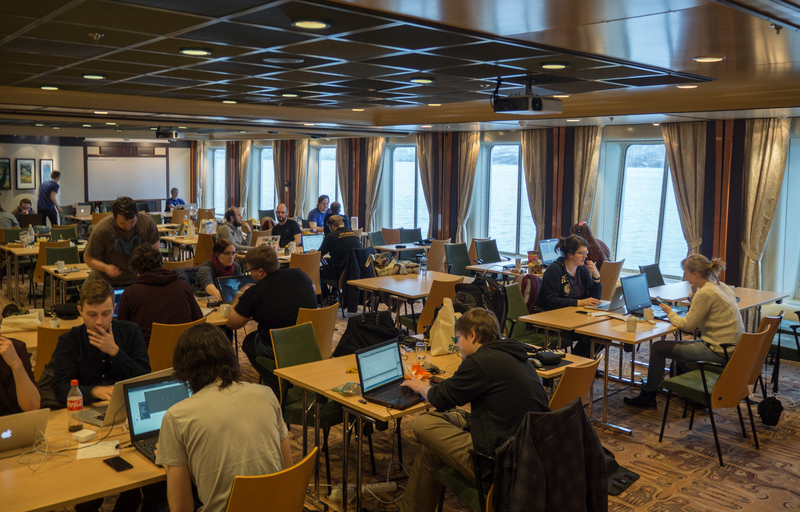 This cruise-bound game jam aboard Hurtigruten’s M/S Finnmarken from Tromsø to Trondheim was by far one of the most memorable game jams I’ve attended. It’s also one in which I felt most proud of the game I worked on, even if sea nausea robbed us of some significant work time, and therefore impacted our proof of concept somewhat harshly. As a lot happened during this event, I’ve decided to split my recollections up into two posts. This one addresses the jam itself, whilst this subsequent post looks back upon the game we made, which was entitled Ardo. My journey from Stockholm to Tromsø took a flightpath which adequately set me up for the weekend, making me very glad I’d chosen a window seat. After the pilot negotiated some truly stunning mountain tops and fjord vistas, I then had a few hours in which to travel from Tromsø lufthavn to the city centre and soak up some breathtaking Arctic scenery. There’s bountiful evidence of this in my Flickr album for the weekend. The jamming hype began to kick in at the café in which I sought refuge from the cold and the setting sun. 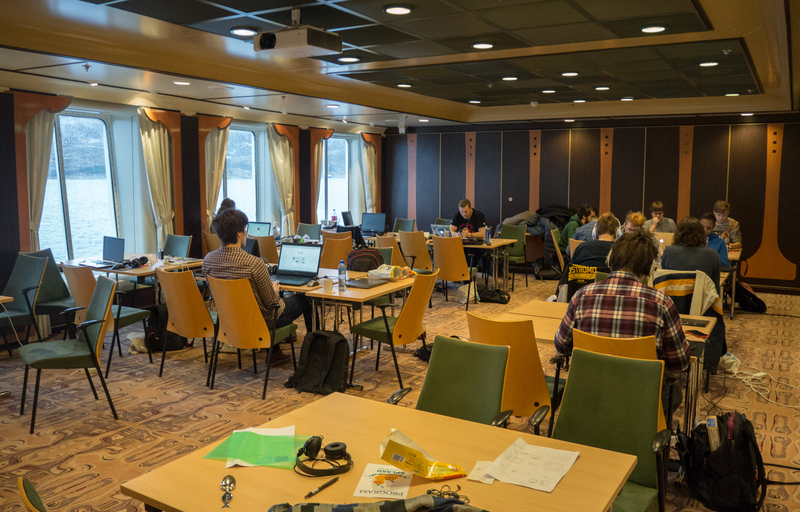 I fell in with a group of other early arrivals who’d travelled to northern Norway from many different countries – as is typical for a European game jam. Eventually the time came for us to head to Flow co-working space in Tromsø, but not before we were treated to a timely appearance of aurora borealis. Aurora Borealis, as seen from the Flow co-working space in Tromsø. Ideation began immediately after the jam’s theme was announced – that being the idea of ‘beginnings’. The process (still led by Garbo) moved through an explicit ‘come up with the most obvious idea you can’ to ‘scrap that, and come up with something amongst yourselves’, all with a relatively free reign. A few pitches were invited up onto the stage about halfway through this process, which helped some groups find the last few developers they might need to round off the group. I’d already sought out an earlier artist acquaintance of mine, and happened across a programmer with whom we could form a reasonably tightly-knit group. We made use of an existing and relevant idea of mine, upon which I’ve been brewing for a while. Thus we – like many of the rest of the jammers – spent the rest of the evening musing on our idea in a relaxed fashion, and sampling the nordnorsk beers. As M/S Finnmarken‘s departure time from Tromsø was 01:30, seemingly most of the jam attendees passed on the idea of jamming that night, and instead took the opportunity to rest after the day’s travels. This jam ended up being one of the healthiest I’ve yet attended, as whilst the first night was fine, Splash Jam experienced widespread seasickness and nausea on the following nights, as the cruise route took the vessel out from the fjords to relatively open sea. With that having been said, the mood aboard ship during the daytime was friendly and vibrant, turning to gobsmacked at the drop of a hat as we might at any moment be interrupted by the sight of a mountain spur moving right past the conference room window. At every turn we had such reminders that our very jam site was being steered down some of Norway’s most beautiful fjords. Added to that were a handful of events providing a little local flavour – not least the memorable tasting sessions for tran (cod liver oil) and tørrefisk (fish dried for 3-4 months). When Splash Jam pulled into Trondheim harbour on the Monday morning, the mood seemed generally pretty satisfied – though I think we were all disappointed not to have another day or so aboard ship. This seems to have been as much a result of us not planning for maritime nausea as it was a reflection of the comforts and sights we were afforded aboard M/S Finnmarken. Still, a triumphant procession wound it way from the Hurtigrutekaj to the wrap-up event in Trondheim’s Work-Work venue. There we made last-minute changes to our projects, enjoyed access to a steady (and free) wi-fi connection, and experienced each other’s games through informal playtesting and an occasional showcase on Work-Work’s large projector. Not every group seemed to complete a game, and those which were shown at Work-Work came in dribs and drabs as further changes were made. I feel this was fitting though, and all the more accommodating towards such a large bunch of attendees. Of the games that were shown, many had explored unconventional control schemes – be that holding half a controller behind your back, inviting the entire venue to vocally join a Viking chorus, or making a game which involves throwing a tablet device in the air. Some (including the tablet-tossing Torbjørn Hawks’ Norwegian Baby Juggling by Andy Touch and Martin Mathiesen Kvale) were downright hilarious, others veered to the bizarre, and some presented an experience whose beauty matched the jam’s former surroundings. I left Trondheim feeling profoundly changed, which is not uncommon for a game jam. Special events like this do put an interesting spin on the act of game creation though, be it in seeking inspiration from one’s surroundings (as happened extensively at last year’s Lyst Summit), enjoying the company of a new and interesting bunch of developers (one of the advantages of everyone being on a cruise ship rather than commuting into a city venue), or in simply granting us license to do something we enjoy in an unusual place. The latter is something which game jamming has really settled into in recent years, with increasingly greater diversity in locations and themes. Long may that continue, despite the benchmark which has now been set by Norway’s natural scenery at Splash Jam. Splash Jam was principally arranged and organised by Henriette Myrlund and Runa Haukland of Framverk and the Hamar Game Collective.